Sunday evening, a group of Israeli civilians waiting at a bus stop next to the town of Ofra in Samaria were shot at – the victims of another act of terror against Israel. Shira Ish-Ran (Shira Yael bat Liora Sara), a 30 year old pregnant woman was critically injured and though doctors successfully delivered her baby (Rach HaNolad ben Shira Yael) prematurely, the baby has taken a turn for the worse. 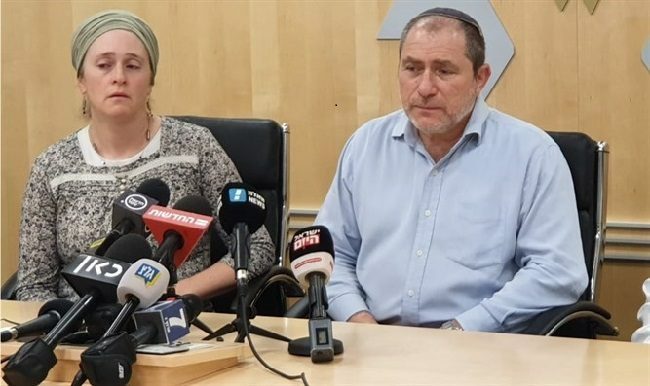 Shira’s husband, Amichai (Amichai Yishai ben Galila), is in good condition and recovering from bullet wounds to the leg. Pictured above are Shira’s parents. Her father Chaim has been with AFSI on many of our tours in and around Jerusalem. Hamas calls the shooters “heroic.” This is the same Hamas that the United Nations failed to condemn last week. “We must put our own price on terror.” Justice Minister Ayelet Shaked urged PM Netanyahu to normalize the status of Ofra in Samaria, following the attack there last night. The United States drafted a resolution condemning Hamas at the United Nations and was voted on last week but failed to condemn Hamas’s terrorism against Israel. “Is the hatred of Israel so strong that you will defend a terrorist organization, one that is harming the Palestinian people? Isn’t it time to let that go? For the sake of peace and the sake of this institution I respectfully urge my colleagues to this resolution,” UN Ambassador Nikki Haley said. Despite Danon’s comment, this is another shameful act that occurred at the United Nations, a place where hypocrisy reigns. A place that no longer fulfills its charter of maintaining worldwide peace and security. Until there is full condemnation at the United Nations there can be little progress in the fight against terrorism.